There was a time on this blog where I did a lot more creating than I have done lately. It has been a long time since I have written a song parody. (You can see all the ones I have written here.) The last one I wrote was actually not even featured here in the Break Room. A man came across my blog and asked if I could write a song parody for his friend that was retiring as an elementary school principal. The parody “Mamas Don’t Let Your Babies Grow Up To Be A Principal” that I wrote at his request was read at his friend’s retirement party and played to guitar music, too. That was a definitely a fun moment for me! I loved that this silliness found it’s way from here to a memorable real-life event thousands of miles away. So, today I decided to come back with another one. This one is not written for retirees, however, but for those just starting out: the college students. There was a time that I was a college student when I made many meals out of Ramen Noodles and taquitos. I ate healthier food at times but, in general, college life for me (and for most) is a very frugal, fast food fueled existence. 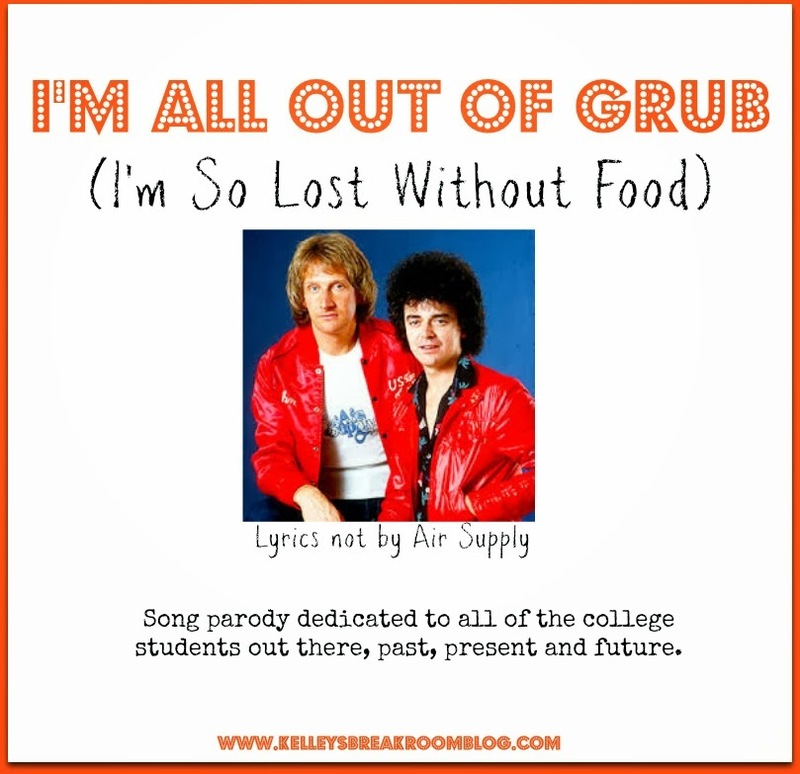 And, hence the song “I’m All Out Of Grub”, not by Air Supply. Thinking of how my stomach hurts. I know yours hurts, too, but what else can we do? We shoulda never had fried chicken from Quik Mart. Until the day comes I have a job of my own. It’s really late, but, OH LOOK! Taco Bell’s light’s still on. And later I’ll have a Sprite. She’d ask me, “What’s wrong with you son? Where is some good grub?